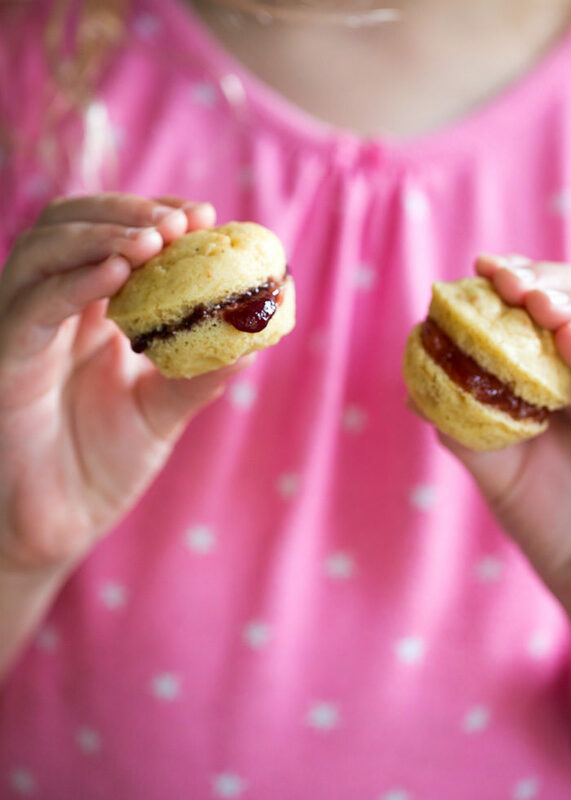 Perfect for lunch boxes or grab-and-go breakfasts, these mini muffins are sure to delight (almost) every kid. Because of said selectiveness, I’m working a little harder on trying to come up with a variety of foodstuffs that she’ll actually eat when she opens her lunchbox at school. I really liked the base muffin recipe though, and wasn’t ready to let it go. 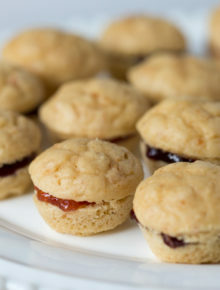 It uses very little sugar, has a bit of protein from the nut butter, and is totally tasty with a little smear of jam. 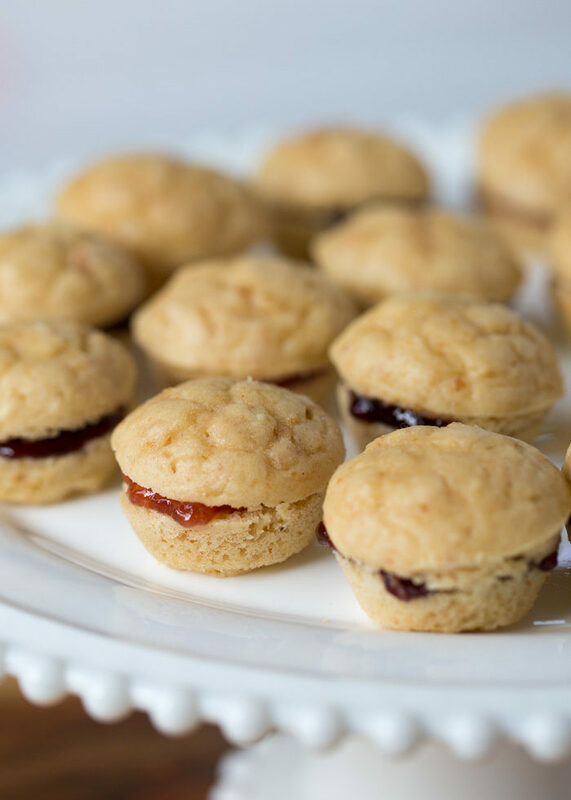 And, I soon discovered, when you cut these cute mini muffins in half and put the jam inside, you’ve got the little mini muffin sandwiches! Even cuter! 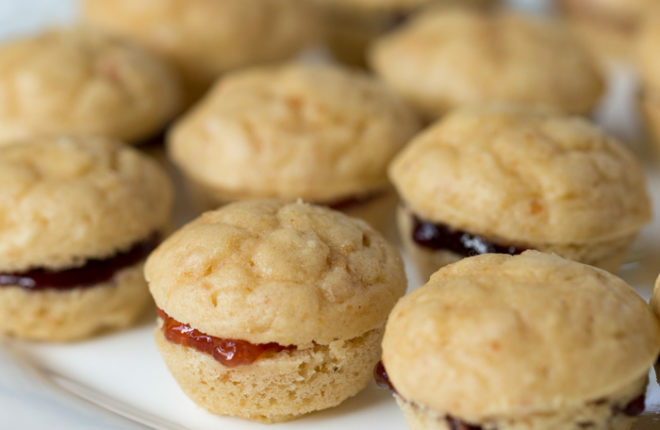 Not only are they cute, but with the jam inside, they’re perfect for travel. 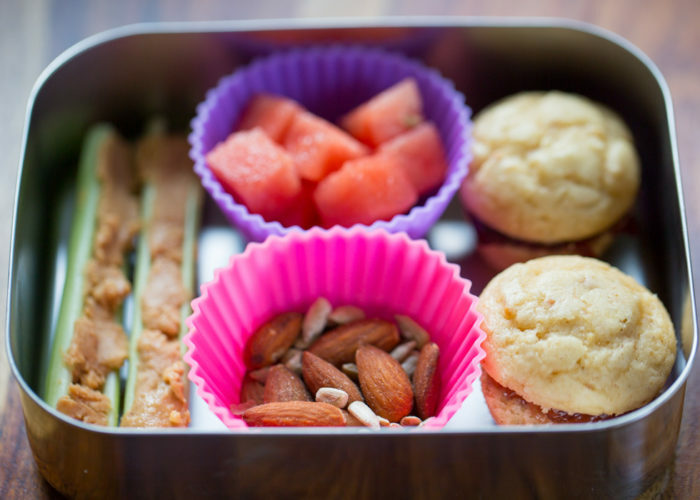 Say, for school lunches! Oh, and does our daughter like this version? Well, no, to be honest. No she does not. Because (silent sigh) … she doesn’t like jam. A smear of Nutella gets the thumbs up, though! Preheat oven to 350 degrees Fahrenheit. Spray the cups of a 24-cup mini muffin pan with nonstick spray or grease well with a little oil. In a medium bowl, whisk together the peanut butter, egg, and sugar until smooth. Add the milk and vanilla and mix. Pour the wet ingredients over the dry ingredients. Stir with a whisk just until smooth. Don’t overmix as that can lead to tough muffins! No one wants tough muffins. Bake 8-10 minutes, until the tops spring back when you poke them and a toothpick inserted into the center comes out dry. Remove from oven and place on a rack to cool for about 5 minutes. Using a butter knife to help pry the muffins out of their cups, gently remove the muffins and place them on a wire rack to cool completely, about 20 minutes. 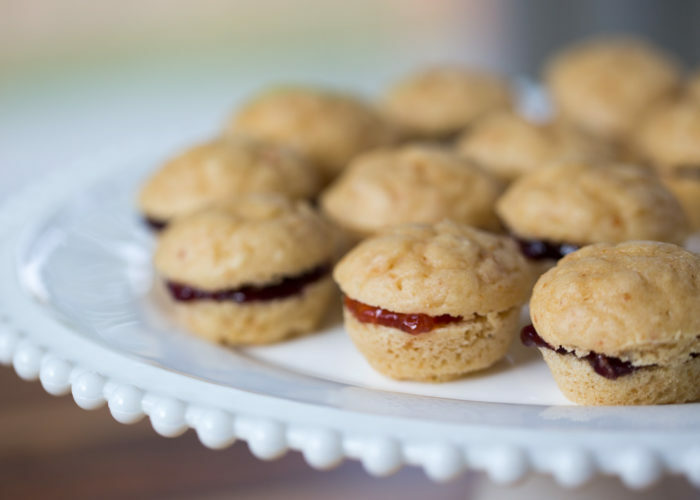 Cut muffins in half, spread on 1/2 teaspoon of jam on the insides of each bottom half, and then replace the top. Muffins keep in an airtight container at room temperature for 2-3 days. Muffin recipe adapted from weelicious.